After the occupation of the city of Fukuoka and the Saga prefecture in January, civilians living in the Fukuoka prefecture were left without central government after the capture of the Fukuoka Prefectural Office. Fearing potential anarchy or a power vacuum to be filled by gangs or warlords, the people of the Fukuoka prefecture rallied and signed a petition to Mori Motonari, requesting annexation. Shogun Motonari responded to the petition, sending in troops to the province and establishing Shogunate control. The move is welcomed by locals, even those who did not sign the petition, as the troops will be assisting in stabilizing the province. A labour force will be deployed to the area as well to improve roads, repair buildings, establish basic infrastructure, etc to improve the living conditions of the people. Fukuoka was just one of the many territories claimed by the Shogun in a recent decree. 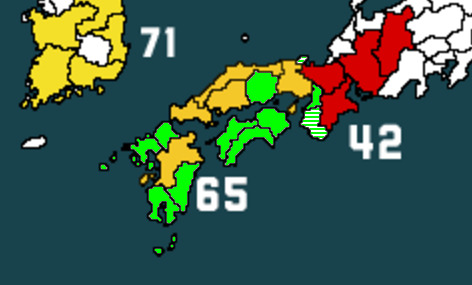 All green territories are claimed by the Shogun, and will be incorporated by the Shogunate over the next several years.